Commercial Shelves. Custom Built Industrial Grade Steel Shelving Systems and Units Made In The USA. Before investing a small fortune in a move to a larger facility, why not make more efficient use of the existing floor space and vertical cube you already possess? Commercial shelves and commercial shelving systems by Easy Rack can be purchased either straight from our factory or custom built by an Easy Rack material handling expert. They will transform areas of your facility that are currently empty and unused into vital, accessible, efficient, and safe storage areas. Easy Rack adds daily to its commercial shelving inventory and stocks every major model and design familiar to the industry. We can also deliver uniquely sized models and build custom shelving systems specific to the exact dimensions and operations of your building interior. Easy Rack manufactures commercial shelves in open backed and closed back units that allow you to divide inventory into supplies that need to be quickly and conveniently accessed and more sensitive materials that may need to be sealed off periodically from the environment, or accessed on a less frequent basis. Easy Rack commercial warehouse shelves are made from the highest-grade steel and coated with protective materials to prevent corrosion and damage from accidental impact. If your warehouse is frequently open to the outside air, consider the benefits of procuring units built to withstand the elements and last for years to come. 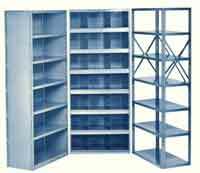 Wide-Span, or rivet units as many people call them, are the largest commercial shelving units we sell. They can transform empty walls into efficient, highly organized material storage space and can support the heaviest pieces of equipment in your warehouse. Widespan commercial shelves can hold up to 35,000 pounds of weight, and they can be interlocked together to line even the longest of walls in factories and warehouses. Easy Rack knows that every facility is different, and that industrial clients often specialize to such a degree that the materials, supplies, and tools they require are very unique in comparison to the operation down the street. Since the founding of our company, we have made it a point to customize commercial shelving for every client with unique or specialized needs. Easy Rack specialists are master designers who know how to make something useful out of every square foot in your facility. Unlike consultants who come onsite holding an invoice, our specialists will help you develop a custom commercial shelving system free of charge over the phone. Our wide selection of commercial shelves allows us to build a system to the precise dimensions of your floor space and material storage needs, and we can do this using either new commercial shelving units or used units in near-factory condition. Investing in used commercial shelving is an excellent way to save on procurement costs and still purchase everything you need. Rather than investing in a bare minimum of equipment and possibly robbing your facility of vital storage materials, why not talk to an Easy Rack specialist of about industrial, rivet, warehouse, and custom shelving systems built from used materials? The savings you obtain can be as much as 40% in comparison to buying the same models in factory/new condition. Easy Rack stocks a vast inventory of commercial shelving, material handling equipment, used pallet racks, and modular prefab buildings installed nationwide. If you can not find what you are looking for call us toll free at 1-888-776-3720 and we will find it for you. Our home office is located in Houston, Texas with warehouses located throughout the United States that enable us to service all 50 states including Oyster Bay, New York, Bakersfield, California, Riverside, California, Stockton, California, Buffalo, New York, St. Paul, Minnesota, Anchorage, Alaska, Lexington-Fayette, Kentucky, St. Petersburg, Florida, Glendale, Arizona.